It's been a weird pre-E3 month. Companies like Microsoft, EA, and Bethesda have made big announcements before the big show. Nintendo's not even doing an official press conference at all. Is there still a point to E3? Or has it become a walking, talking, slowly dying dinosaur? It's been a sort of inevitable question among many fellow journos I've run into this month. What's the point of E3 these days? What does it actually accomplish anymore? Who's tuning in, and what is everyone trying to show them? Is it for diehard fans? The mythical, unicorn-like "mainstream audience"? Some awkwardly clashing hybrid of the two? Jason still adores E3, but I'm on the fence. We've seen a preposterous number of mic-drop-level announcements happen before the show this year, but that might actually be a wise decision for publishers. They'd probably get crushed in the rhino-stampede-like flood of mid-E3 announcements otherwise. It makes some degree of sense to disperse these things, to let folks like you and me really dig into them on our own time instead of hurrying along like we're trying to get in line for every ride at the carnival (and believe me, E3 is absolutely a carnival). On the other hand, if we deemphasize the importance of E3 even more, it makes less and less sense for anyone to actually go there—let alone spend the amount of money some people do just to attend and demo a couple games. Developers and publishers from outside the US, especially, have to go through tremendous trouble to coordinate their E3 song and dance, not to mention halt development on a lot of games to produce demos and send development leads to E3's grimy, sweaty, desperate frontlines. And then there's the matter of smaller development studios and indies, many of whom have become the gaming industry's prime movers and shakers, yet can't really afford to spend precious time or money on E3. Plus, E3 is where the big dogs puff out their chests, bare their meticulously filed teeth, and trot out their armies of totally-not-boothbabes. Last year indies did a slightly better job of standing out by getting creative with side conferences like Horizon and grassroots efforts like Indies Crash E3, but they still barely made a dent in the grand scheme of things. In that sense, it's been interesting to watch E3 evolve—or really, to watch E3 tread water while the ceaseless march of progress forces it to evolve, little-by-little. But is it enough to justify all the hassle? And does anyone care enough relative to how much they'd care if these announcements were just made some other time, some other place, or by way of something far cheaper and more directly aimed at fans like a, er, Nintendo Direct? Or even something more accessible for mainstream fans, for instance the (urgh) Spike TV VGXs? On a personal note, I remember feeling like E3 was my Christmas back in my younger days. I'd hungrily devour every scrap of news, tear through new information like so much colorful wrapping paper. Maybe I was just younger, but I feel like there were more surprises back then, or at least more I was interested in. I remember staring longingly at E3 galleries in magazines and then later watching live-ish coverage by way of things like G4, X-Play, and 1UP. Now, though, I attend personally and feel markedly less... anything. I don't think I'm any less interested in games as a whole. I just think I'm interested in different games, different aspects of them. The consumeristic glitz and glamour doesn't really hold the same majesty it once did, and the weird sexism that pervades feels like a relic of a history gaming is trying to leave behind. I do miss the magic, though. Business deals happen at E3, but they also happen elsewhere. How valuable is that particular space for those things? At least on that front, the numbers seem to speak for themselves. I reached out to E3 organizational body the Entertainment Software Association, and they told me that—according to attendee survey data—$2.5 billion dollars of buy orders were made due to what retailers saw last E3. Further, 91 percent of business attendees called E3 a "must-attend" event, and 98 percent said it was useful for their business. So if you're doing retail business (E3's original purpose), then it's still the place to be. It's still a tricky situation, though. How useful is E3 for promotion, press, and announcements anymore? Is any of the madly grandiose opulence—entire indoor wrestling rings, gigantic flashing signs, life-sized tank replicas, impossibly expensive parties, etc, etc, etc—still worth it? And how much of an impact does it have on online stores like Steam, where decisions ride less on outcomes of big events and more on community buzz? I asked a bunch of games industry members, and here's what they think. JP LeBreton, former BioShock developer and current lead on Double Fine's Spacebase DF-9, offered what was perhaps the most damning assessment. He's really, really, really not a fan of modern-day E3 or what it represents. Not in the slightest. "E3 was only really meaningful to me during the triple-A phase of my career. With Horizon it seems like it's sprouted a pseudopod that's useful to indies and I applaud that effort. For the most part I associate E3 with big publishers outspending one another, the cocaine-and-strip-clubs side of the industry I hope we will live to see fired into the sun one day." Far Cry 3 and Child of Light writer Jeffrey Yohalem, having also come from a big-budget background, isn't ready to write off E3 yet. It brings people together, he says, and that's enough. "This year I thought about staying home, partially because Child of Light is a download-only game and I didn't think any of my friends would be going. It turned out that I was completely wrong. I received several emails from friends at both indie studios and triple-A studios asking if I was coming. So that was the clincher for me. Anytime I can get together with colleagues to discuss ideas and games, I'm there." "Plus, I entered the industry through E3 eight years ago as a game reviewer, so it's always occupied a special place in my heart. I usually don't spend that much time on the floor. It's the people orbiting the show that matter. So, for me anyway, E3 operates as a catalyst to bring us all together in one place for epic, passionate conversations. As long as it continues to do that, I'll be there. In the future? As downloadable games gain traction, I have a feeling it might become entirely about hype-generation between studios and journalists." As someone newer to the scene, Samantha Kalman, creator of superbly chill musical puzzler Sentris, doesn't know whether E3 is worth caring about or not. She's conflicted, especially because she thinks E3 has lost a lot of its luster since the good old days. "I've never attended E3 before, but I might be attending this year. I used to look forward to E3 for all the new game announcements, trailers, boiling-over excitement. I looked forward to being surprised and delighted at the press conferences. Every year I loved searching through all the videos to see some game I'd never seen before. Okami comes to mind in this regard." "Something has been changing though, maybe since they tried downsizing E3 a few years ago. I've found my interest in E3 shifting toward hearing the people in the industry I already follow talking about their impressions of games there. This was my primary motivator for consuming E3 this year." "As a new/emerging indie, I'd never expected to be able to demo my own work at E3. It seemed too flashy, too larger-than-life, too retail- and business-focused for a download-only game like mine. But a week ago I was presented with an opportunity to do just that. So should I do it? Honestly, there are a few reasons not to. Because the game is so audio-focused, a noisy show floor is not the ideal demo setting. Getting a build together would be disruptive to my schedule—it's a major crunch to commit to, and it's only been a few weeks since my last crunch ended. And appearing on the show floor doesn't guarantee any attention, especially considering the stiff competition." "All that said, if the game doesn't appear at E3 then it has a zero percent chance of attracting any attention. Is the cost of attending worth the possibility of exposure? I have no idea." SoundSelf creator Robin Arnott, however, thinks E3 is actually really good for indie games—at least, in terms of exposure. Difference stands out there, he believes, because most of the bigger budget games are so same-y. "As an indie, E3 is incredibly good for press. I've gotten some of the best coverage—in terms of hits and lasting mindshare—for SoundSelf at E3, and I think that's partly because reporters there who do make their way to the Indiecade booth are that much more excited about the stuff there *because* it's different. 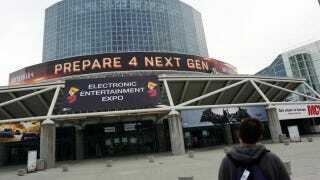 Because, in comparison, so much of E3 is drab and the same." "I have no idea what E3 will look like in 10 years... but if it follows the industry trends, which it should, right? I'd be surprised if there isn't ten times the indie representation as there is now. Also, we're just breaking the seal of VR, and there's certain to be a ton of innovation in that field in the coming decade. So I'd anticipate a bigger hardware and potentially biometric focus than there currently is." "I still go to E3, because the ten-year-old boy in me still wants me to. He still wants to see massive plastic statues and new blockbuster games. He still loves that his favorite pastime warrants such a media frenzy in-and-outside the industry. He reads PSM and I read blogs, but they all cover E3 in full force. We both want to know what the next Final Fantasy will be like." "Teen me is jealous that twenties me gets to attend, that my games are there. He doesn't yet understand why booth babes make me sad and angry, or why I'm bored at the thought of waiting in line to play a game in a noisy, ill-suited environment. School's out for summer, and he has all the time in the world to read E3 news. He can't believe I'll spend the week working, catching up with out-of-town friends, and spending less than a day on the show floor." "But I'll do me and he'll do him, and the droves of 10-year-olds and 10-year-olds-at-heart whose eyes still glimmer at the sight of E3 coverage, maybe they'll see me and my friends' indie games through the din of flashier, pricier booths, thanks to indie press events, or IndieCade's hard work. They should probably just go to PAX though, and I can talk to press over a nice cheap coffee with my game on a laptop." What do you think, though? Whether you're a developer or a business person or just someone who plays games and likes knowing what's right around the corner, how do you feel about E3? Do you still get excited? Do you take time off from work to keep up with every last video, interview, and impressions piece? Or are you burnt out on E3 and its cavalcade of pageantry, sequels, and non-surprises? Tough Questions is a recurring feature in which we ask both game creators and game players a big question about a seismic topic in the world of gaming. So chat away, discuss, share perspectives, etc. Developer, gamer, or something else entirely, you're an important part of the discussion, so don't be afraid to speak up.